Smartphone Sales Are Way Up – Which Phone Are You Using? It would appear from the latest data on the sales of smartphones that no matter what operating system or manufacturer you choose, sales are way up across the board. According to new research from IDC, the sales of smartphones reached a new record level in the fourth quarter of 2009. According to the company’s research, a total of 54.5 million units were shipped in the three months ending Dec. 31st, which was up 39 percent from a year ago. For all of 2009 a total of 174.2 million units were shipped, representing an increase of 15.1 percent from the 151.4 million units shipped in 2008. Smartphones accounted for 15.4 percent of all mobile phones shipped in 2009, up from 12.7% in 2008. While smartphones haven’t conquered the overall cell phone market yet by a long shot, they are showing no signs of doing anything but growing. What is surprising is that no matter how much we might all talk about the iPhone, Apple is still in third place in the cell smartphone sale’s race behind Nokia and Research In Motion (the makers of BlackBerries). Although it is impressive when you think Apple essentially sells only one model of phone that it is in third place, but from the amount of coverage it receives, you would have to think the company was in first. Here are how the numbers broke down for just the fourth quarter of the year. And here is the break down for all of 2009 which has some major shifting in the fourth and fifth potions compared to the final quarter of the year. We rarely hear about Nokia phones in the United States, yes, we have them, we just don’t seem to talk about them very much for whatever reason. However, that sure doesn’t seem to be stopping them from dominating the smartphone market. With a nearly 20 point lead over second place, good luck to anyone who thinks they can challenge them. Okay, so enough with the numbers! Lets get down to the important business here: What brand of smartphone, if any, do you carry? I’ll get the ball rolling by saying I just got my third BlackBerry in early August. 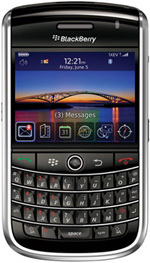 Having started with a 7290, and then an 8830, I’ve kept with the quad-band theme and got a BlackBerry Tour 9630. I do travel to Japan from time to time, so a world phone is important to me. I would get an iPhone if I could, but my deep hatred of AT&T keeps me from doing that, so until such time as Apple moves to all carriers, I guess I’ll be a BlackBerry guy. What brand and model are you carrying? Any particular reason you went with it?